HD picture quality, and even Full HD picture quality, may be the norm for pocket camcorders but when it comes to getting HD video on a compact camera, this is a different issue entirely. Sony has managed, however, to squeeze in 1080i video recording capabilities into its DSC-HX5V range of cameras, something it is boasting as a world's first for picture takers this small. Part of the CyberShot range, the HX5 isn't the best camera we have seen looks-wise but its functionality that counts in this market as the HX5 has plenty of this to go around. Not only does the HX5 have HD shooting capabilities, it boasts a 10x optical zoom, GPS and Backlight Correction High Dynamic Range – which essentially makes your underexposed images look a whole lot better. 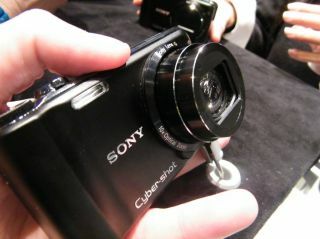 The camera also uses some of the new technology which Sony announced at CES 2010 – most notably Transfer Jet. This great little feature allows you to transfer images to different devices in a superfast way. Putting Bluetooth to shame, you can wirelessly send a number of images to another camera with Transfer Jet, or PC in a matter of seconds. On the back of the camera, there's a 3-inch LCD, and there's a 10fps shooting mode within the camera so you can shoot fast-moving objects lightening quick, hoping that one of the ten images will come out okay. Alongside the HX5, Sony has also announced the TX7, which has the same HD functionality. Both cameras, you will be pleased to hear, can now handle SDHC cards so there's no need to use Sony's proprietary Memory Stick. This has been a long time coming but we are glad that Sony has finally got the message. Expect both cameras to be out Q2 of next year in the UK, with pricing still to be announced.